What exactly was Moscow promised in 1990 by the West? This has been the subject of much dispute. There should be no dispute. There is not a shadow of doubt that Russia was very specifically promised that NATO would not expand by both American and Germany. Perhaps, the only reasons for some confusion are some misleading statements to the contrary by Gorbachev's former foreign minister, Eduard Shevardnadze. These statements have been proven totally false by the record, and in our view the only reason that he made them was because he later became President of Georgia and wanted Georgia to join NATO. There are also people in the United States who deny that such an agreement with Russia was ever made, such as former U.S. Secretary of State James Baker. However, after speaking with many of those involved in the negotiations and examining previously classified British and German documents in detail, the German News magazine DER SPIEGEL has made the argument that the West did everything it could to give the Soviets the impression that NATO membership was out of the question for countries like Poland, Hungary or Czechoslovakia. After all, why would Moscow even agree to the unification of Germany unless they were getting something in return? US SECRETARY OF STATE STATES IN DISCUSSIONS THAT NATO WOULD NOT EXPAND "ONE INCH TO THE EAST"
NATO's then-Secretary General Manfred Woerner stated in a speech delivered in Brussels on May 17, 1990, that "the fact that we are ready not to place a NATO army outside of German territory gives the Soviet Union a firm security guarantee (National Interest, 4-16-07)." CAN ONE DEPEND ON AMERICAN POLITICIANS? Now, 20 years later, Gorbachev is still furious when he is asked to comment about this episode. "One cannot depend on American politicians," he told SPIEGEL. Gorbachev has also said, "They probably rubbed their hands rejoicing at having played a trick on the Russians," he then added that this had led to Russia's disillusionment with post-Cold War relations with the West. WHY DIDN'T GORBACHEV GET THE WEST TO PUT ITS AGREEMENT IN WRITING? One argument from Western politicians is that this agreement wasn't in writing, so it doesn't exist. So why didn't Russia get this agreement in writing? 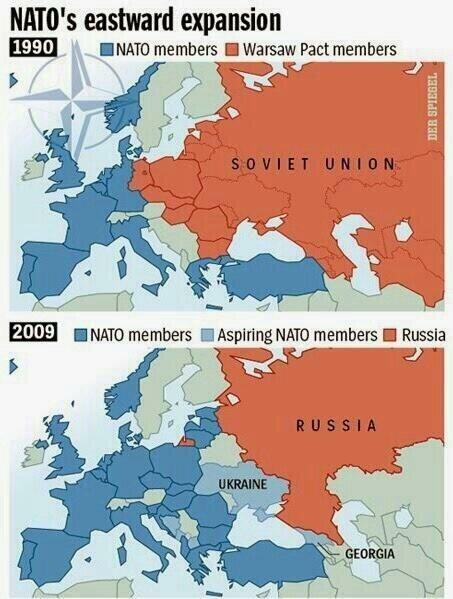 For one thing, the idea of NATO expansion into the East at the time was absurd. As Der Spiegel points out, no Eastern European government was striving to join NATO in that early phase, and the Western alliance had absolutely no interest in taking on new members. It was too expensive, an unnecessary provocation of Moscow and, if worse came to worst, did the Western governments truly expect French, Italian or German soldiers to risk their lives for Poland and Hungary? Yet then in 1991 the Soviet Union collapsed and things changed. There was the war with Bosnia where thousands died, and suddenly many Eastern States wanted to join NATO.